Have you ever envied your envied your friends at the bakery that they get to write a whole lot of stuff on their cakes, and wished you could do the same with your steaks? Well, guess what? Your wish just came true! 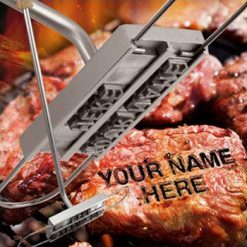 Presenting the cool and suave Custom BBQ Branding Iron! The Custom BBQ Branding Iron is beautifully crafted out of steel, has a wooden handle and 52 changeable letters. All that’s required from your end is a witty mind and some good vocabulary. Using it is a breeze; all you got to do is heat it up properly and stick onto that sizzler to brand it. Here’s some good news for the vegetarians as well, the Custom BBQ Branding Iron can be used with veggies too and you’ve got the license to brand your capsicums and eggplant. 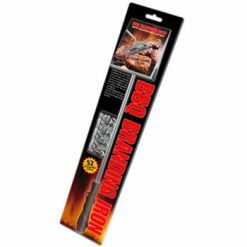 The Custom BBQ Branding Iron is an awesome gift idea for the budding chef at home, your dad, mum, or even your neighbor! Hurry up and order a few online now. 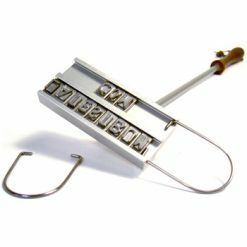 The Custom BBQ Branding Iron is made from steel, features a wooden handle and comes with 52 changeable letters (no tools required) to spell out your messages. The branding iron measures 43 cm long. The attached lettering plate is 9 x 4 cm. Please note: Not suitable for children under 3 years old due to small parts. This product requires adult supervision when being used by children.